Built on a foundation of tradition and quality, Fabriano offers Medioevalis, a complete range of elegant blank cards and envelopes. Medioevalis brings a distinctive Italian style and grace to personalized invitations, greeting cards and announcements for all occasions. Cards feature a soft white mould-made paper with deckle edges. Perfect for offset, inkjet or laser printing, pen, pencil, charcoal, pastel, light washes, stamping, rubbings, stenciling, printmaking and letterpress. 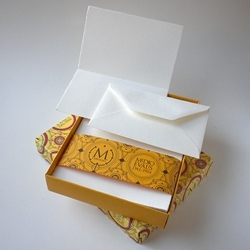 Card weight is 260 gsm and envelope weight is 120 gsm.